First told you guys about Nick Di Paola’s upcoming Boca Black Box- Friday (2/8/19-8pm) and Saturday (2/9/19 7pm & 9pm) shows on 1/3/19. Just checked the box-office (bocablackbox.com) and goldstar.com (discount tickets) and there are a handful of real good tickets left for all 3 shows. I’m thinking SRO when all is said and done, so if you wanna go and haven’t yet gotten tickets- time to make your move. Trust Jeff Eats on this one, this guy Nick Di Paola puts on an absolutely great show! * Comedian- Nick Di Paola. One of the funniest “edgiest” comedians in the business! 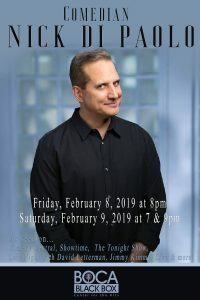 Nick Di Paola In this day of watered down comedy Nick Di Paolo’s brutally honest performances remind us of what great stand up should be – funny, socially relevant and a little bit reckless. His strong political opinions and razor wit make him a perfect fit for talk radio. He hosted his own shows on New York’s 92.3 Free FM, “The Nick Di Paolo Show” on SiriusXM, co-hosted “The Nick & Artie Show” and currently hosts “The Nick Di Paolo Podcast”. He has performed on The Tonight Show, Late Night with David Letterman, Jimmy Kimmel Live, and Conan O’ Brien. He was twice nominated for an Emmy for his writing on HBO’s The Chris Rock Show. He has also had three half hour standup specials on Comedy Central, a Showtime Special “Raw Nerve”, a self released special “Another Senseless Killing” and most recently “Inflammatory”. He was one of the stars on Tough Crowd with Colin Quinn and a stand out on many Comedy Central Roasts. Not limited to stand-up, radio and writing, he has had acting roles on FX’s Louie, Inside Amy Schumer, The Sopranos, Cop Show and CK’s critically acclaimed Horace and Pete as well as many other sitcoms.